In 1995, Elijah Moshinsky had the inspired idea of presenting his production of The Barber of Seville as if it were taking place in a silent Hollywood movie. His designer, Michael Yeargan, matched his inspiration with an inventive multi-level set complete with plenty of doors to slam, and outrageously lurid wall-papered rooms for his characters to inhabit. To ensure that the characters weren’t swamped by their surroundings, costume designer, Dona Granata has clothed them in a kaleidoscope of witty period costumes. What a pleasure it is to have the opportunity to experience this production again in this beautifully cast and meticulously produced 2016 revival. Maestro, Andrea Molino, conducting the Australian Opera and Ballet Orchestra, immediately raised audience anticipation with a crisp, carefully detailed performance of Rossini’s familiar and justly famous overture, which, if you didn’t already know, contains not one reference to the glorious music to follow. Rossini’s endlessly inventive opera of mistaken identities and thwarted love, comes to delirious life in this splendid revival in which the audacious concept and design are matched by the outstanding cast of superb singers ready and willing to take full advantage of the endless comedic possibilities offered in this madcap world in which every improbability almost seems logical. 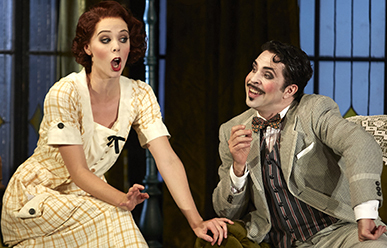 With a reputation of being one of the world’s outstanding buffo interpreters, Paolo Bordogna, has already become an audience favourite with his cheeky comedic performances in Opera Australia’s earlier productions of The Turk in Italy and The Marriage of Figaro. However, as Figaro in this production, Bordogna is irresistible. Displaying his expansive baritone to great effect, he tosses off the famous Largo al Factotum with the expected panache, then keeps the audience’s eyes glued on him whenever he is on stage, with inspired clowning, becoming a sort of genial master of ceremonies amidst the chaotic events swirling around him. However in the buffo department, Bordogna gets some stiff competition. Samuel Dundas and Jane Ede, looking like two Adams Family escapees as Ambrogio and Berta, create a pair of remarkably off-handed servants who almost steal the show with their deadpan antics, as they usher in and out a continuous procession of hapless patients. The busy Dundas also gets to demonstrate his versatility as Almaviva’s servant, Fiorello, and as the Notary and is unrecognisable in all of them. Warwick Fyffe also mines the rich vein of humour inherent in his role as the cantankerous, Dr Bartolo, particularly in the scene where he suspiciously presides over Rosina’s singing lesson with the disguised Almaviva. As the thwarted young lovers at the centre of the opera, Anna Dowsley and Kenneth Tarver are a delightful pairing. Tarver, making his first appearances in Australia in this production as Count Almaviva, is widely recognised as the bel canto tenore-de-grazia of his generation. That is easy to believe as he impresses, not only with the beauty of his floating tenor voice, and the ease with which he negotiates the bel canto passages of his arias, but also with his wicked sense of humour which fits perfectly with Anna Dowsley’s wilful Rosina. Dowsley, who is making her role debut in this production, also impressed with her confident singing, her elegant sense of style, and especially, her ability to hold her own on a stage on which she is surrounded by some of the world’s most experienced exponents of the opera buffo style, performing at the top of their game. This production of The Barber of Seville is one to be savoured and judging from the continuous hearty laughter throughout, and the enthusiastic audience response during the curtain calls, the audience at this performance were doing just that.